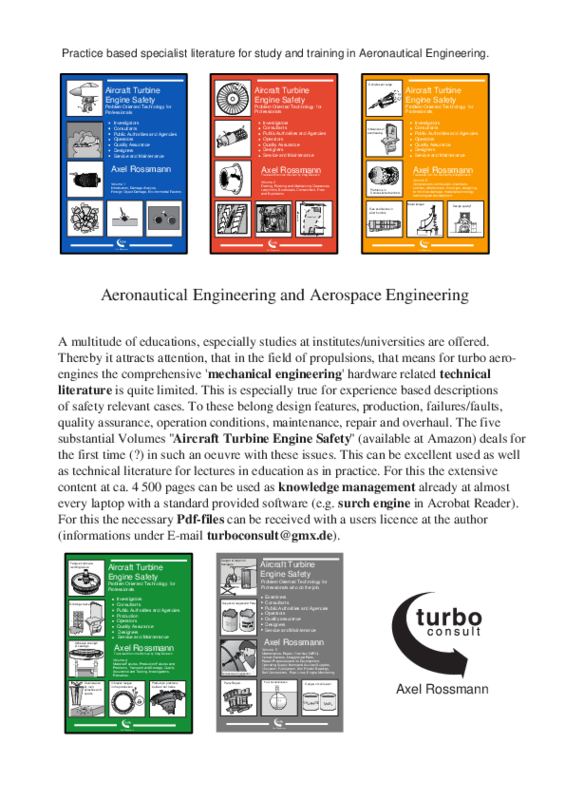 These books are based on many years of experience and practical responsible work in the field of aeroengines and industrial gas turbines. Here is, what the author has learned since many years with the German editions of these books (see also the home page www.turboconsult.de). The content discusses especially problems, which obviously, normally can not be found in the available literature. This seems to be predominantly focused on theory, but hardly helps sufficiently in practical questions which are often highly safety and cost relevant. It seems that many problems in the practical work, which are not published, are not even known. So the books presented here, are (for the first time?) primarily intendended as an important help for experts and practitioners of all disciplines, ‘who do responsibly the job’. They belong to almost all divisions like purchasing, development, manufacturing/production, testing, engineering, assembly, marketing and sales and the internal training. Also schools and universities can motivate students for their studies and prepare them for their later job. Last not least very important are which authorities, especially with a safety related background. From my experience for them these books can be especially helpful. For a better understanding the special lay out is choosen. To every problem there are illustrations of the problem with a related text. Often examples from the „real life“ are presented and discussed. A multitude of educations, especially studies at institutes/universities are offered. Thereby it attracts attention, that in the field of propulsions, that means for turbo aeroengines the comprehensive 'mechanical engineering' hardware related technical literature is quite limited. This is especially true for experience based descriptions of safety relevant cases. To these belong design features, production, failures/faults, quality assurance, operation conditions, maintenance, repair and overhaul. The five substantial Volumes "Aircraft Turbine Engine Safety" (available at Amazon) deals for the first time (?) in such an oeuvre with these issues. This can be excellent used as well as technical literature for lectures in education as in practice. For this the extensive content at ca. 4 500 pages can be used as knowledge management already at almost every laptop with a standard provided software (e.g. search engine in Acrobat Reader). For this the necessary Pdf-files can be received with a users licence at the author (informations under e-mail). 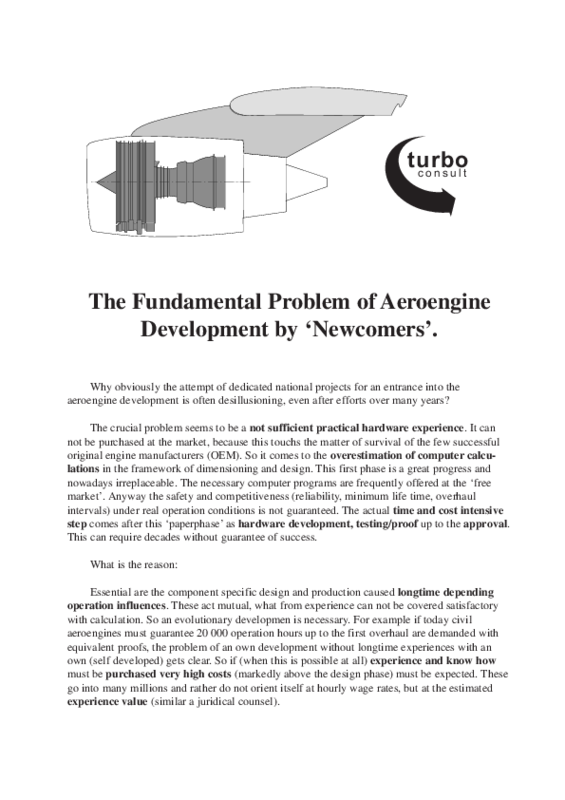 Why obviously the attempt of dedicated national projects for an entrance into the aeroengine development is often desillusioning, even after efforts over many years? The crucial problem seems to be a not sufficient practical hardware experience. It can not be purchased at the market, because this touchs the matter of survival of the few successful original engine manufacturers (OEM). So it comes to the overestimation of computer calculations in the framework of dimensioning and design. This first phase is a great progress and nowadays irreplaceable. The necessary computer programs are frequently offered at the ‘free market’. Anyway the safety and competitiveness (reliability, minimum life time, overhaul intervals) under real operation conditions is not guaranteed. The actual time and cost intensive step comes after this ‘paperphase’ as hardware development, testing/proof up to the approval. This can require decades without guarantee of success. Essential are the component specific design and production caused longtime depending operation influences. These act mutual, what from experience can not be covered satisfactory with calculation. So an evolutionary developmen is necessary. For example if today civil aeroengines must guarantee 20 000 operation hours up to the first overhaul are demanded with equivalent proofs, the problem of an own development without longtime experiences with an own (self developed) gets clear. So if (when this is possible at all) experience and know how must be purchased very high costs (markedly above the design phase) must be expected. These go into many millions and rather do not orient itself at hourly wage rates, but at the estimated experience value (similar a juridical counsel). The project of the hardware development with testing based proofs must be primarily considered in the budget. In contrast the phase of computer based dimensioning calculation are rather low and short time. So experiences with the long time behaviour must be compiled which are based on the own components develoment. This application based knowledge is earls indispansable. It enables as well the estimation of the failure mechanisms influences as also the hopefully early identification of the component specific weak points. Compared with the mostly more theoretically oriented calculation experts (frequently with university background) hardware specialists with the necessary experience is considerable more difficult to get,especially to evaluate their offered expertise. Remember: There is no cheap way to get an OEM with aeroengine development!